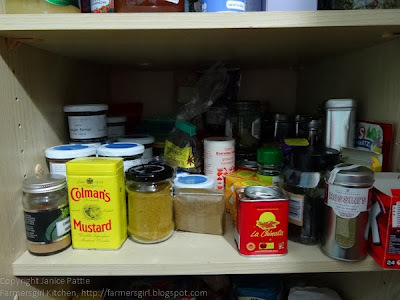 Farmersgirl Kitchen: Dare to bare...your kitchen cupboards! Dare to bare...your kitchen cupboards! In an effort to give us an easy time for the busiest month, Dom has decided, that for our Random Recipes, we should open our larder and cupboard doors and show everyone what is inside! Now I like a nicely ordered cupboard, but my good intentions don't seem to last long and everything always ends up shoved in. I've tried using tubs and jars to decant my ingredients, but it just doesn't seem to work for me. I do have some little baskets to try to keep the little pots and jars in, but it could all do with a tidy up again. I have a big double, floor to ceiling, larder unit and this is the shelf with all the random spices that don't fit on the spice rack on the inside of the other door. At the front cinnamon, Colman's mustard powder, La Chinata sweet smoked paprika, black peppercorns, a herb/spice rub and some beef oxo cubes. In the shelf below I have more of the baking ingredients, that tub of Food Thoughts cocoa shouldn't be in that basket, but has obviously been shoved in as I couldn't get it in anywhere else. 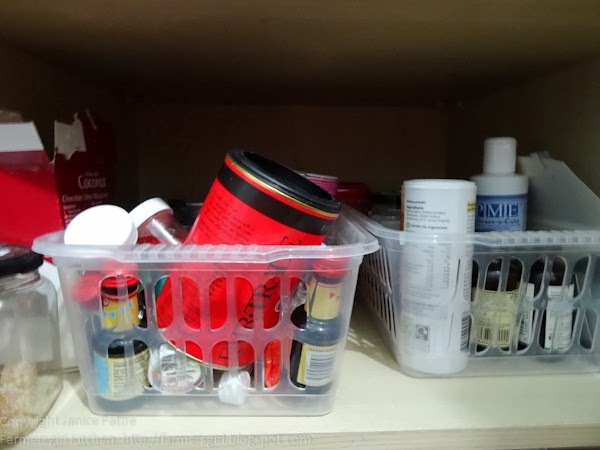 There are some bottles of food colouring, a jar of crystalised ginger and, over on the right, baking powder, cake release and vanilla extract. This is the worst cupboard, pasta, rice, beans and a giant bag of granulated sugar I bought in my online shop without realising it was so big! The green box sticking up is vegetarian suet that I used for my mincemeat. I do have to say that there is not much in the way of out of date goods, I had a good clear out not that long ago. I hope you enjoyed a look into my larder, if you'd like to join in pop in to Belleau Kitchen to find out more about this excellent blogger challenge. That seems pretty neat and organised to me, Janice. I didn't know there was yeast in mincemeat! Hmmm. Thanks for sharing. I haven't yet plucked up the courage. Lou, there isn't yeast in mincemeat! I am obviously too tired to blog, it should be Vegetarian Suet lol! I've changed it now. 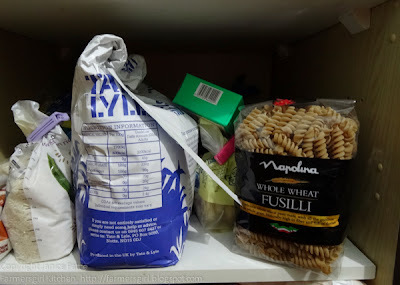 If anyone has ever found a way of storing pasta, rice, sugar etc. neatly without resorting to huge cupboards and lots of decanting then I'd love to hear it. Your shelves are much neater than mine. Maybe I should hire a butler. I'm a little worried that this challenge could force me to find some seriously out of date stuff in my sad cupboards. Great post! I would never dare to bare!! Thanks for letting us have a look in your cupboards. It looks neat and organised to me! I am jealous of your large larder. I need more space! Oh gosh,m that looks so neat and tidy Janice. I yearn for order in my cupboards, but just don't have enough room, so everything gets shoved in any which way AND it drives me nuts.